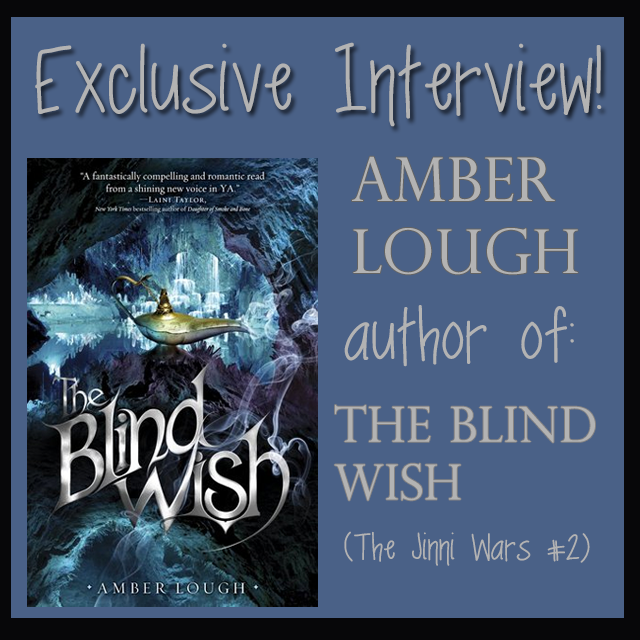 We're excited to have Amber Lough here to tell us about THE BLIND WISH, the next book in her Jinni Wars series. Amber, what was your inspiration for writing THE BLIND WISH? First, I hadn’t planned to write a sequel, but once it was laid before me, I knew what to do. I wanted to find out what happened next, and how these two girls fit in their newfound worlds. I must also admit there was a bit of Biblical inspiration as well. One of the hardest scenes for me to write involves Zayele facing what she has done to Yashar, and how she has changed him. It was difficult because I wanted her to know she had not accomplished what she’d intended to do, and the effect it had on Yashar was hard to describe, at first. I wanted to keep it mysterious, as well as build up the emotional weight of it. I feel silly recommending books that are far superior to mine, but I’ll do it: the Alanna series by Tamora Pierce; LARK RISING, by Sandra Waugh; and SILVER PHOENIX by Cindy Pon. How long did you work on THE BLIND WISH? I only had about nine months to write and polish it, which was insanely fast for me. I also had a major depressive episode during the process, which hampered the writing quite a bit. But I made it! I’m alive, the book is finished to the best of my abilities at the time, and I’m proud both of the writing itself and the fact that I made my deadlines. I can write a book, even if it is hard, even if I don’t know what I’m doing half the time, and even if all I want to do is curl up on the floor of my office—I can do it. 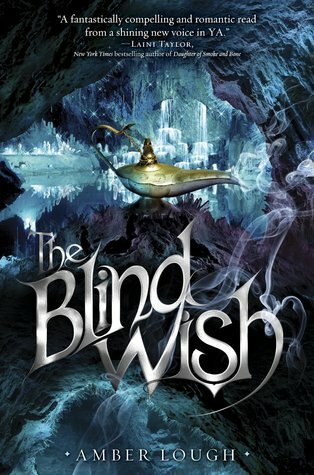 What do you hope readers will take away from THE BLIND WISH? Stand by your friends and family, even when it is hard, and even when you’re too ashamed to face them. I started writing novels in 2006, shortly after my first child was born. I wrote one novel, queried for an agent, signed with my agent, and then that book did not sell. I had my second child at that time, and was crushed, but I kept on. I started what was to become THE FIRE WISH in 2009, and it sold in 2012. In 2013, I started writing THE BLIND WISH, which was harder than either of the other two because I was on a tight schedule and had a lot going on personally. Still, if I’d quit at any moment before that, I’d never have known how deep I will dig to get a story written. After my first book didn’t sell, I thought hard and long about which sorts of stories I loved when I was 14, and it hit me—fantasy, all the time. So I started daydreaming what sort of book would I have gobbled when I was that age? Something set in Arabian culture (because that’s where I was at the time, in Bahrain), but with magic and crystals. I am all over the map. I’d probably write faster if I stuck to one place, but I’ve moved house five times since I started writing novels (the last time to Europe), and I’ve been forced to be flexible. When I wrote THE BLIND WISH, I was renting an office space from Bruce Coville and would write there, listening to Bear McCreary soundtracks with a bit of Tchaikovsky thrown in. Don’t listen to trends—write what you love to read. And if you can keep taking that daily step towards publication, do it. Hang on and keep fighting. The sisters: Najwa and Zayele have just learned they’re half-jinni, half-human twins. Najwa is now the jinni representative at the human palace, working to bring peace. But her new role comes at a price—she’s no longer allowed alone with her cherished Prince Kamal. And as Zayele adjusts to life among the jinn, she discovers that she’s a magus, one of the most powerful jinn in the Cavern. Suddenly, she’s thrown into special training, and the strongest young men in the army are competing to be paired up with her. Amber Lough lives in Germany with her husband and their two kids. She spent half her childhood in Japan and the Middle East, but studied Russian language and history in University. She loves learning foreign languages, finding common ground between differing cultures, and showing her children the world. What did you think of our interview with Amber Lough, author of THE BLIND WISH? Let us know in the comments!